Dean was born on Sunday, March 3, 1935 in Fish Springs, TN. When he was 5, his family moved to Salida, CO for his Dad’s job with the D & R G W Railroad. He wrote in a 6th grade class assignment that he wanted to be a pilot when he grew up. He kept a copy of that paper. He was a member of the Civil Air Patrol where he soloed in a J-3 cub. After Dean graduated from Salida High School, he attended New Mexico A&M College in Las Cruces, NM. 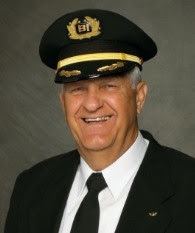 He was accepted into United States Air Force Aviation Cadet Pilot Training class 59-H and began Basic Training in March, 1958 at Lackland Air Force Base in San Antonio, TX. He then went to Graham Air Force Base in Marianna, FL for training in T-28’s and T-34’s where he met a tall, blonde student nurse there. He asked her to dance while the music playing was “Stars Fell on Alabama”. His next assignment was Reese Air Force Base in Lubbock, TX for training in T-33’s, where he earned his wings on June 10, 1959. And then ten days later, he married that student nurse. He was assigned to Harlingen Air Force Base to fly the Navigator Training program in T-29’s. Their son, David, was born there in October, 1960. Dean was then assigned to James Connolly Air Force Base in Waco, TX to continue the Navigator Training Program. Their son, Kevin, was born there in August, 1964. He joined Braniff Airlines July 1, 1965 in Dallas, TX. He flew almost every type equipment Braniff had over his career – Convair-240 and -340, BAC-111, B-707, B-727, B-747, A320. The highlight of his pilot career was flying the Concorde from DFW to Washington, DC on scheduled flights, after training in Toulouse, France. 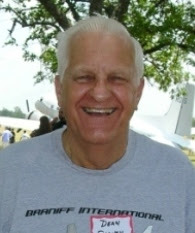 Since 1971, Dean was a member and Deacon at Northway Baptist Church. He served on several committees. Dean is survived by his wife of 57 years, Dottie, their son Kevin and daughter in law, Vicki. He is also survived by daughter in law Jana, granddaughter Allison Fields, and her husband, TJ Fields, great grandson Thomas Fields III, grandson Andrew Smith. He is also survived by his favorite (only) mother in law, Myrtle DeLong. He has several nieces and nephews. Those preceding Dean to heaven are son, David, brother, Stewart, nephew, Michael Dean and his parents, Paul and Velma. 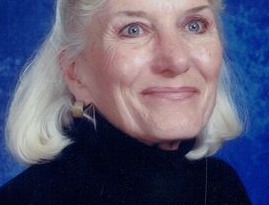 Visitation is Thursday, August 11 from 6:00-8:00 PM at North Dallas Funeral Home. Graveside is Friday, August 12 at 9:00 AM at DFW National Cemetery.